The Standing Stone: Carrigeen, Stone Row, Co. Tipperary. Carrigeen, Stone Row, Co. Tipperary. Location - At the foot of the Arra Mountains near Nenagh in the townland of Carrigeen and sometimes listed as being in Barbaha townland. Description and history - This stone row is really very nice and not nearly well known enough. It is located on poorly drained pasture land and is only one of many things to see in the local area. 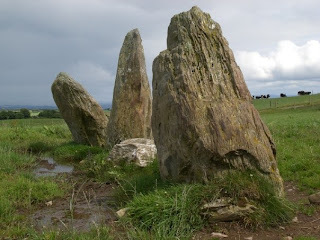 Although one stone has collapsed and none are standing as they once were they provide a glimpse into a once vibrant ritual landscape as the proximity of a stone circle and many barrows indicate. These stones probably date to the Bronze Age and are spread out over 8m in length with the highest measuring 1.9m in height. Packing stones are visible around the base of all the stones. It can get a little boggy around the stones as cattle roam around them but it looked as if the stones had been free of cattle for some time and the little bog they sit in was all but dried up. I would like to go back here and get some more photographs. On the day I went I moronically left my camera at home and relied on my sister in law to do the photo taking. Difficulty - This monument is located on private farm land and is only accessible through the farms trackways. You, therefore, need to obtain permission from the owner. But it is well worth it. The trackway leading to the farmhouse is poor and unless you have a four-wheel drive or a sturdy car I suggest you park at the entrance to the trackway and walk. Around the stones can be quite muddy to wear good boots. Photo taken by Vicki Gilchrist.